St. Claudine Thevenet, the foundress of the Congregation of Jesus and Mary was born at LYOUS, France on 30th March 1774 during the French Revolution. Claudine's two brothers were among those prisoners who were led to the place of execution. They passed close to Claudine who had taken her stand on the wayside to have a last glimpse of her brothers. As they passed, one of them managed to whisper to Claudine "Forgive Glady, as we forgive". She certainly forgave her brother's executioners but this young girl of 19 was never to forget the cruel scene of her brothers being clubbed to death after they were shot. Claudine knew that ignorance of God, lack of love and a sense of insecurity were the main reasons for the demoralization of men after the French Revolution. She therefore started the work of caring for and educating unwanted children. Other young ladies followed her example and joined her. By 1818, Claudine was chosen by her companions as the first superior. She is thus the Foundress of the Congregation of Jesus and Mary. In 1841, a call came from distant India, from the Bishop of Agra, Rt. Rev. Dr. J.A. Borghi, to work in the mission field of Agra for the education of young girls. The call was joyfully accepted and a brave of six nuns set out for India facing many dangers on land and sea. They left Marseilles on 28th January 1841 by ship via Alexandria, Cairo and the Sinai desert and reached Bombay on the 15th of June the same year. Because of the South West Monsoons, these nuns could not come to Agra directly by the land route they had to set sail for Calcutta which they did on the 15th June, reaching Calcutta on the 27th of the same month. From Calcutta they went to Allahabad by steam boat up the Ganges river. From Allahabad they travelled in bullock carts to Agra where they arrived on the 11th November 1842. The European and Indian Christian Communities with Bishop Borghi at the head, came out to meet the "Brave Nuns". They were led to Akbar's Church where our girls sang the Gregorian Hymn "Jesus Corona Virginium" and the Pontifical High Mass was sung. The guns boomed the whole day in honour of the nuns. After Mass the nuns were led to their Convent which was a spacious airy bunglow, once the property of General Cartwright. The present convent at St. Patrick's Junior College is still maintained in the same house. The dawn of 1845 saw the inception of St. Anthony's. It was in the house of the military chaplain in the Cantonment area that St. Anthony's made its humble beginnings. It was the vision of our Mother Foundress to train the minds of young girls, so that they could lead a life which was purposeful, positive and constructive, to be able to live fruitfully and happily in society with others. In 1902, the school shifted its premises to what had been the Alliance Bank (the present Pre-Primary Block), a building on the Mall Road which was more suitable in every way. 26th December 1926, a never to be forgotten date in the history of St. Anthony's, as it got its recognition from the D.P.I. as a primary School, and the Institution made a steady march towards progress. The Government requested the closure of class V and VI. But as some parents did not wish to send their children to a Boarding School, Classes V and VI continued. By January 1927, the school had an enrolment in studies, music and dramatics. Efforts were made to raise funds for the construction of Claudine Block, to suit the growing needs of the school. When in 1942, Agra became the headquarters of the Central Command, the school’s enrolment was 240 pupils. As the needs of the institution grew, the Dina Block was constructed. As Indian Culture received a strong impetus through music with traditional musical instruments, by November 1949. St. Anthony's was fully equipped with a full Indian Orchestra. Since 1942, music has a place of prime importance in the curriculum. 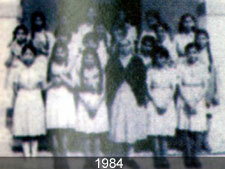 Independence brought An Influx of Indian pupils of various family background, culture and creed to St. Anthony's by 1952. The Josephine Block was constructed, which was a set of four spacious rooms that relieved the difficulties of overcrowding at least for a short time. Many interested visitors came to the school during the years of expansion, including Archbishop Vanni, an old friend of the school, who Had a tribute of praise for the good work done, when He inaugurated the new building. The need for more accommodation for children and domestic staff was imperative and so the "annexe" (Dina Block), renovation and extension and sanitary facilities were also added. To meet the increasing demands for accommodation, the sisters decided to build yet another block "The Marian Block" in 1980. In the same year, St. Anthony's became an institution only for girls, to provide education in particular to the girl child. The year 1984 brought good news for the institution as it got its affiliation from the I.C.S.E. Board New Delhi, and the institution sent up its first batch of I.C.S.E. Students. Moving steps further, in 1986 the institution became a centre for the I.C.S.E. Board Examination and in 1998 the institution sent up its first batch of I.S.C Students. From a very insignificant beginning, the institution has grown by leaps and bounds not only in terms of infrastructure, but also imparting quality education and discipline, and living up to the homely values that were cherished by our Foundress, Claudine Thevenet.